The Primus Sports Injury Report » Sports Injury reports from a Former NFL player turned Surgeon! Sports Injury reports from a Former NFL player turned Surgeon! 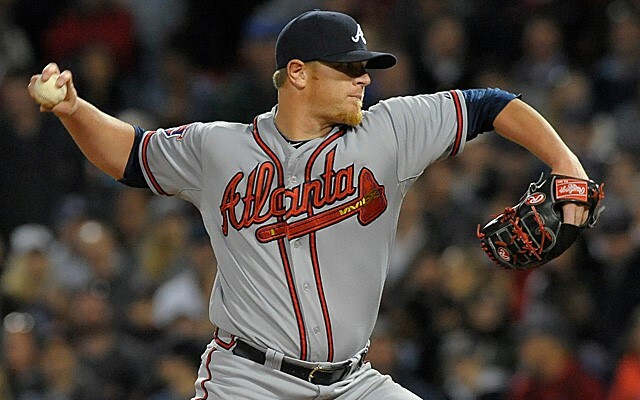 It was announced on Tuesday that Atlanta Braves, David Carpenter, has been placed on the 15-day disabled list due to a strained right biceps. The biceps muscle is on the front part of the upper arm. The muscle is attached to the elbow, and at two places in the shoulder. 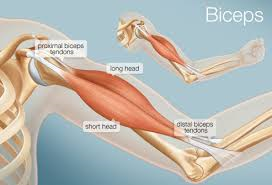 Inflammation of the long tendon, which runs over the top of the upper arm and attaches to the top of the shoulder blade, is fairly common for athletes. A grade 1 strain is a minor overstretching or pulling of the biceps muscle or tendon, this involves no tearing of muscle or tendon fibers and results in no loss of strength. 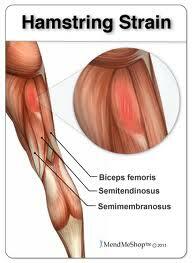 A grade 2 strain causes moderate tearing of the biceps muscle or tendon and may result in some loss of strength. 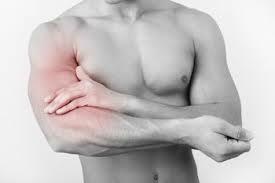 A grade 3 strain is a severe or complete rupture of the biceps muscle or tendon and may require surgical repair. People who participate in contact sports, throwing sports and weight lifting are more likely to strain their biceps, as well as people with poor circulation, poor nutrition, previous upper-arm injuries and poor muscle conditioning. Warming up before physical activity and participating in a strengthening and conditioning program can help you prevent a strained muscle. What are the symptoms of a bicep strain? Typically in most cases the symptoms are mild. They might include swelling, mild pain, bruising and tightness. What are the treatments for a bicep muscle strain? Most injuries will respond to ice, rest, elevation, muscle relaxers and anti-inflammatory medications. In very rare situations the muscle could become a sprain and then different intervention, including surgery, might be required. How long is the recovery time? Most bicep strains respond to treatment in from four to six weeks. 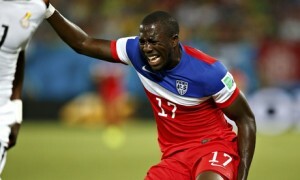 Forward Jozy Altidore, the team’s leading goal scorer in 2013, left the United States’ 2014 FIFA World Cup opener against Ghana after 20 minutes with a strained left hamstring. 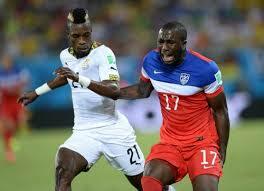 Altidore, 24, was attempting to run down a long forward feed when he pulled up in pain, grabbing his left thigh. He was replaced in the lineup by former AZ Alkmaar teammate Aron Johansson. United States defender Matt Besler also is dealing with a right hamstring issue. United States soccer still beats Ghana with John Brook’s goal. Outdated Strength and Conditioning Program for the Cowboys? 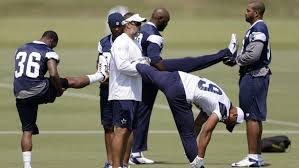 Can the outdated, static stretching, regiment that the Cowboys do be affecting the players and putting them at risk for injury? Studies have shown an improvement in flexibility after both static stretching and dynamic stretching compared to no stretching at all. Athletes in sports requiring lower-extremity power should use dynamic, rather than static, stretching techniques in warm-up to enhance flexibility while improving performance. Dynamic stretching keeps joints and muscles moving, and can mimic movements that are specific to a sport. Static stretching will help elongate the muscles but there is no movement of the muscles during stretching activity. Blood circulation, strength and endurance are improved by the continuous movements involved with dynamic stretching. Static stretching can increased the blood pressure, but sometimes to dangerously high levels. Static stretching should not be painful. The stretch should be held steady for 60-120 seconds to achieve the full effects of the stretch. Dynamic stretching helps increase blood flow, core temperature, and activates the nervous system, linking the brain and the muscles. While both types of stretching can be beneficial to an athlete, as mentioned previously, dynamic stretching should be practice by those athletes that require more lower extremity power. Every player on the football field has to use lower leg power at some point during the game. Appropriately warming up muscles can help reduce the occurrence of injury. The Dallas Cowboys are aware that their current strength and conditioning program is outdated. However, other sports teams and/or athletes may want to consider the differences between these to forms of stretching before stepping into action. One of Costa Rica’s best players, Alvaro Saborio, will be out of the FIFA World Cup due to a fifth metatarsal fracture in his left foot. The fifth metatarsal bone is one of the long bones in the middle of the foot, the very last bone on the outside. 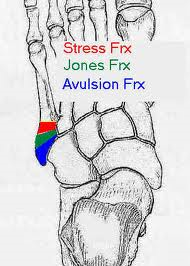 There are three types of fracture that can occur here: stress, avulsion and Jones. An X-ray is usually required to confirm diagnosis and assess the severity of the fracture. An avulsion fracture occurs when the tip of the bone is pulled away from the metatarsal. These fractures can typically heal with cast and rarely require surgery. A Jones fracture, are more difficult to heal, and often require immobilization, protection from weight (crutches), and they may require a surgery. Stress fractures of the fifth metatarsal are the hardest to heal, and may require surgery. These fractures often start with vague pain on the outside of the foot, often thought to be tendonitis. Over time, the stress fracture can become a complete break. A 5th metatarsal fracture commonly occurs in association with a rolled ankle, particularly when the ankle has rolled inwards and when significant weight bearing forces are involved. They may also occur due to an awkward landing from a jump (particularly on uneven surfaces), due to a fall or following a direct blow to the outer foot. 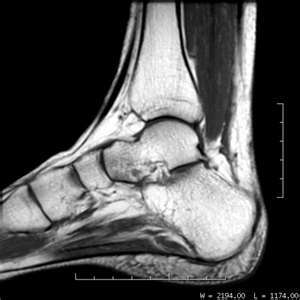 5th metatarsal fractures are common in running and jumping sports involving change of direction such as football, soccer, rugby, basketball and netball and in dancing (e.g. ballet). Costa Rica is set to open at the World Cup in Brazil on June 16 against Uruguay. Saborio is expected to miss three-to-four months after breaking the fifth metatarsal bone in his left foot. 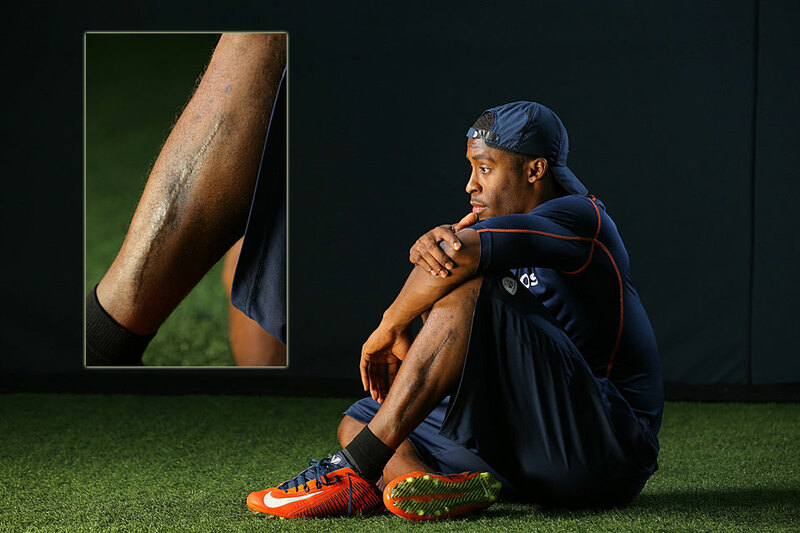 What Almost Made Rahim Moore Lose His Leg? Broncos safety Rahim Moore’s season ended November 2013 due to lateral compartment syndrome. According to theMMQB.com, Moore said he began to feel intense pain in his leg several hours after a game in week 11. Moore said that his leg did not feel right during warm-ups, but eventually caused him to leave the game during the second quarter. Compartment syndrome is a painful condition that occurs when pressure builds in the muscles to dangerous levels. Typically this pressure can decrease blood flow, which, ultimately, decreases nourishment and oxygen getting to nerve and muscle cells. 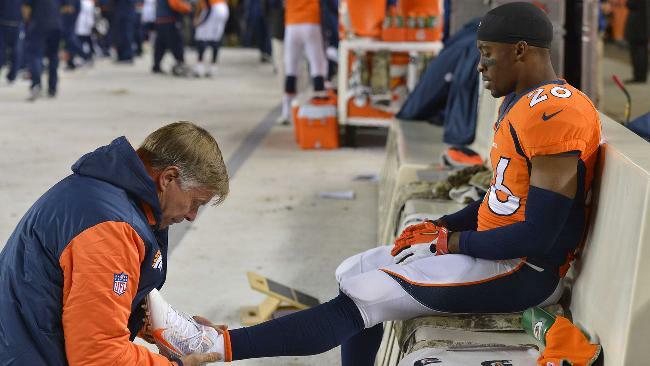 Acute compartment syndrome, which is what Rahim Moore experienced, is a medical emergency. Usually it is caused by a severe injury. What is most interesting about Moore’s case is that he never had an injury leading up to this event. He underwent surgery the following day after the game to relieve the lateral compartment syndrome. Doctors told Moore that had he waited to come in until noon on Monday, they would have had to amputate. Any longer than that and he could have died. In acute compartment syndrome, permanent disability and tissue death can occur if the pressure is not relieved immediately. As mentioned, acute compartment syndrome usually occurs after a severe injury, such as, a fracture or badly bruised bone, for example. Symptoms will include, intense pain, tingling or burning in the skin, tightness or fullness in the muscle, numbness or paralysis can be a late sign indicating permanent tissue injury. 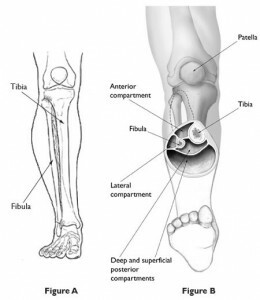 There is no effective nonsurgical treatment for acute compartment syndrome. Surgery is a must! An incision is made, cutting the skin and fascia covering the affected compartment, lateral in the case of Rahim Moore. The procedure is called a fasciotomy. There are times when the swelling is so severe the incision cannot be closed immediately. A skin graft may be necessary in this case. Moore needed two procedures to clean out dead tissue and relieve the pressure in his leg. It took until January for him to begin running. While the re is a chance that the compartment syndrome could return, presently, Moore appears to be healthy and ready to return to the field for the upcoming season.